Just wanted to continue to translate then i remembered... Would you mind to host your strings in transifex, zanata or pootle ? Thanks ! You need to report this to Jolla (the company). Their port on Sony Xperia X is not complete. They're lacking proper video acceleration among other things. What is laggy concrete? Rendering, or map moving when you drag it by finger? How much? Are you able to compare with other Sailfish devices (Jolla 1 or Jolla C) ? Peformance is not my priority right now, but I understand that laggy application may be frustrating. Hi. Project "OSM Scout Server" developed by Rinigus is using libosmscout as one possible database storage and map renderer (second combination is sqlite+Mapnik if I understand). My OSM Scout is based mainly on this library. When libosmscout backend is used in the server, it should be possible to share map databases between both applications, but we don't guarantee it ;-) We are changing database format in upstream library time by time and it would be hard to sync compatible releases. These are the reasons why we have separate servers for map distribution (I don't need to distribute sqlite databases for Mapnik and geocoder). Great to read it :-) Kudos for speedup belongs to Tim, main libosmscout developer. Routing it is fast. Routing lane UI is nice. 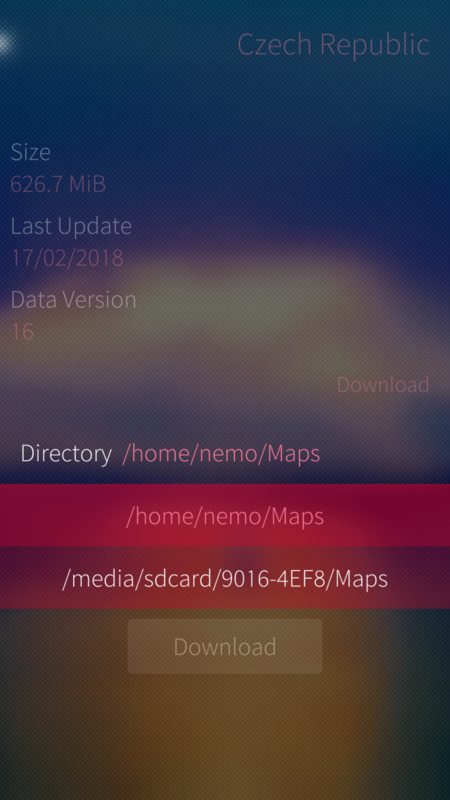 with the update from OSM Scout Server 0.6.2 to 0.7.0, it became impossible to share the offline maps with OSM Scout (0.19 used; both installed from the Jolla Store) via their GUI-based settings. Both have fixed, incompatible directory names now, i.e. <chosen-OSMScoutServer-dirname>/osmscout for OSM Scout Server 0.7.0 and either ~/Documents/Maps or <SDcard>/Maps for OSM Scout. Please implement a setting in OSM Scout to freely choose a directory for the offline maps or follow OSM Scout Server's map-directory settings scheme, and please do abandon the (limited) "~/Documents/Maps *or* <SDcard>/Map"-pulley. The default may still be ~/Documents/Maps, although ~/OSMscout/osmscout may be a better location and is (already) compatible with OSM Scout Server 0.7. Thanks and kudos for this excellent, offline capable map viewer. And solely manage your maps with OSM Scout Server, while you are using this. Note: Just delete the soft link "Maps" to revert this workaround. Version 0.17.1 is pretty fast in rendering. OSM Scout works absolutely incredible with offline maps (Spanish in my case). It could be the best navigation app for Sailfish by far if development continues at this great level. Keep the good work Karry! Absolute thumbs up! I like maps downloader but I would like to say map of Poland which you generated it's not fully functional. You can search for cities, districts but not for streets. I tried to search like this but I forgot about capital letters at the begining of words. Without capital letters you can find nothig. How to activate Polish language? After update to 0.13-1 nothing change, still english interface. Btw, can you update Polish translation for map downloader page please? great work with the downloader! Very slick and works as expected! Thanks :-) There will be always something that is missing to me (updating of existing map, restore interrupted download...), but It does its job. Btw, do you want to integrate it to the server? Maybe I should, but after some time. I am working on search results right now and don't have time for adding download manager yet.